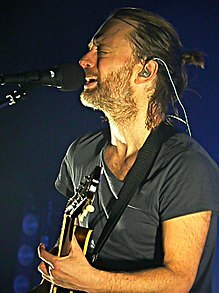 Thomas Edward "Thom" Yorke (born 7 October 1968) is an Inglis muisicker best kent as the sangster an principal sangwriter o the alternative rock baund Radiohead. ↑ McLean, Craig (18 June 2006). "All messed up". London: guardian.co.uk. Retrieved 9 July 2009. ↑ Pelly, John (2 September 2014). "Thom Yorke Confirms That He Was Sisi BakBak, Mysterious SBTRKT Remixer". Pitchfork. Retrieved 9 September 2014. This page wis last eeditit on 4 Januar 2018, at 20:04.